The production of crown glass improved throughout this period and it was possible to make larger panes, as few as Six in each sash. 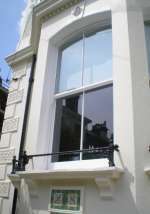 This gave us the distinct “six over six” configuration which we associate with a Georgian sash window. The other feature is, of course, the narrow glazing bar.The London Building Act of 1774 required sash boxes to be placed behind the masonry. 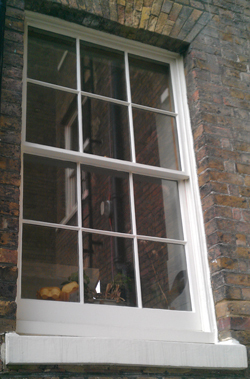 In effect, the legislation meant that the glazed area of the window could be made wider, with almost the whole of the sash box tucked out of sight behind the outer leaf of masonry with very little timber showing. In proportion to the reduced profile of the box, glazing bars became finer. In his Complete Body of Architecture (1750), Isaac Ware had written that "as much glass should be seen, and as nearly a continued body as possible". Our Slimlite units have a patent protected 5mm perimeter seal or sightline which can be covered by a 7mm rebate. At a glazing bar, where you effectively have two rebates either side of a 3 or 4mm “bone”, your glazing bar can be as narrow as 17mm.